Crushpath, a startup founded by former executives from Jive Software and Socialcast that aims to disrupt the sales space, raised $6 million in Series A funding led by The Social+Capital Partnership with participation from Charles River Ventures. The company previously raised seed funding from Marketo CEO Phil Fernandez, Jive CEO Dave Hersh and Box’s CEO Aaron Levie. This brings Crushpath’s total funding to $8 million. As we wrote last year, the basic idea behind Crushpath is to make it easier for salespeople to track their relationships with sales prospects. The company is the brainchild of CEO Sam Lawrence (who founded the company after leaving his position as CMO of Jive Software). If users sign up with Salesforce, the Crushpath platform links up with that database and automatically synchronizes actions like recording sales. Similarly, data from email, news, websites, LinkedIn, Box, Google Evernote also gets pulled into the platform to create a concentrated view of a client and its activities. Promotional materials that a salesperson wants to push to a client can also be stored in the app. 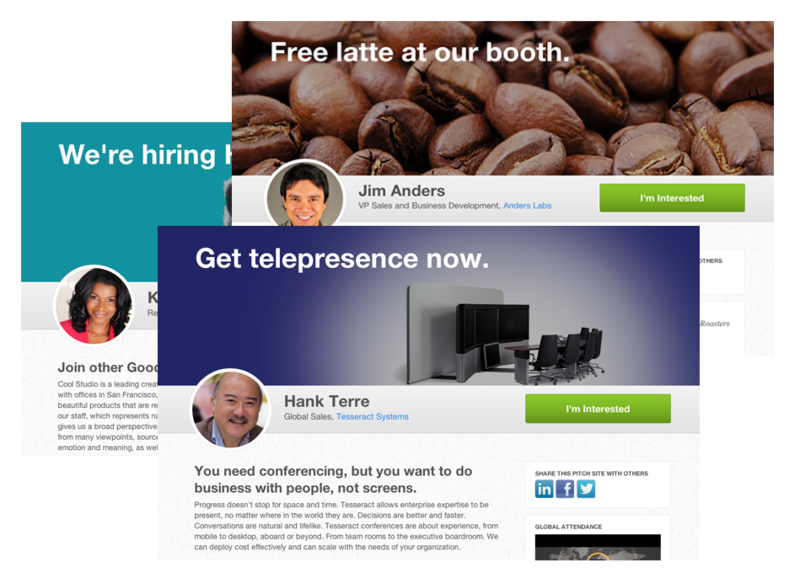 Today, the company is expanding beyond simply sales channels with a new product called Pitch Sites. 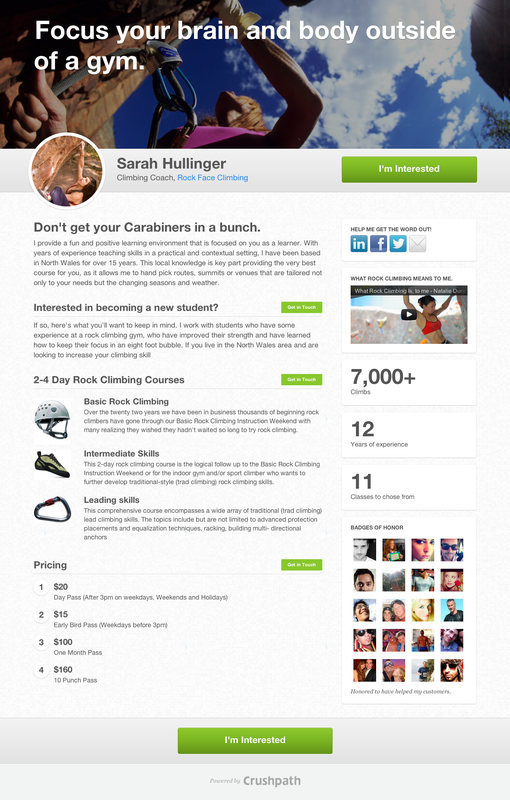 The site aims to give anyone, salesperson or not, a way to pitch, get responses, and also keep track of relationships. Lawrence explains that Pitch Sites are a super visual way to tell story, pitch product idea, a job candidate. “It’s not just for a sales person selling software and creates a play-by-play for any business relationship,” he says. Users who have been testing the product include recruiters, journalists, realtors, business unit managers, agents, entrepreneurs. The product itself is like a visual elevator pitch for an idea, service, person or event. It’s a one page website that allows you to upload text, customer references imagery, videos, links to other content (i.e. content in Box). Users can also customize public or private Pitch Sites that each zero in on a specific customer, product, or offering. Crushpath will help users with SEO and sharing for sites, so that Pitch Sites are searchable, sharable, and social. And you can manage responses and track the success of each pitch with detailed analytics like visits, click-throughs and more. Users can also send emails with links to Pitch Sites via the platform, which are seeing 75 percent click-through rates on average. The product, which costs $9 per month, per person; is already being used by big companies like Cox Communications and McAfee. But Pitch Sites is also serving a purpose amongst individual entrepreneurs as well. A fitness coach is using the platform to find more customers. A fundraiser for high school sports teams is using it to sell her capabilities. The new funding will be used towards distribution of the Pitch Sites product and towards hiring engineer. Crushpath is helping sales people manage relationships, and handle pitches so the next step, says the company is qualification. The startup is going to be developing ways to qualify individuals in the sales process.